As I’ve grown older, I’ve looked that quote up over and over again, but I’m still unable to attribute it to anyone but an anonymous high school philosopher who was bored in math class. It’s funny how life’s universal truths reveal themselves at the most unexpected places and times. Just today, my office team had a standard morning meeting, which is usually a free-flowing albeit relatively predictable run-through of the day’s workload. Today wasn’t unique except for in the most trivial way – we all received a note weeks ago that Nov. 29 was to be the monthly fridge clean-out. The conversation shifted to the office kitchen, and how its cleanliness or lack thereof is entirely dependent on a few key factors. As we pondered what those factors were, we realized we weren’t talking about the kitchen anymore. We were engaged in a deep dialogue about humanity at 9 a.m. on Thursday. When the fridge becomes the breeding ground for germs, the kitchen becomes a breeding ground for feelings of hostility and resentment between coworkers. And when the filthy sink is increasingly swarmed by flies, the kitchen becomes a “Lord of the Flies” petri dish. People point fingers and take sides, the community falls to tribalism, and so on and so forth. Dramatic? Probably, but it is true that a bad kitchen can wreck an office atmosphere. Our office kitchen used to be like that. Fortunately, no longer. While our office kitchen community remains far from a utopian society, we’ve learned a lot here at GovLoop, and we’d like to share. Without further ado, here are three life lessons about society and government taught by the kitchen sink. If you’re struggling with upkeeping your office kitchen, you’re not alone. It’s the same reason why beautiful beaches become polluted tourist traps and why Interstate traffic slows down for seemingly no reason. The concept is called “The Tragedy of the Commons,” and it was popularized by American ecologist Garrett Hardin in 1968. A tragedy of the commons, as you might recall from an obscure political science college lecture, is when a public good is exploited by individuals in a way that is detrimental – even just incrementally – to the resource’s health and usefulness. Your office kitchen is a clear example. Consider the case of a clean dishwasher that needs to be unloaded. Starting off, the sink is clean, and as long as the dishes are quickly put away, they too will remain that way. However, nobody wants to unload the dishes since they’re responsible for only a few of the many, so the dishwasher remains full. And people – without an easy way to clean their dishes – fill the sink with dirty ones. It’s this mentality that sets into motion the vicious cycle of kitchen squalor. My coworker doesn’t like the dirty sink any more than the rest of us, but, like the rest of us, he’s also self-interested. Not unloading is in his best interest and adding a fork or knife doesn’t seem like a big deal. But as most people think the same way, a mountain (literally, of dishes) is created out of a molehill, even as nobody is doing that much wrong. Because while a few dishes in the sink really aren’t a big deal, the free-rider problem spreads like a cold in a crowded elevator. So how do you solve a tragedy of the commons? There’s no easy answer, and sociologists, psychologists and politicians alike have been struggling with the conundrum since well before the phrase was coined. Still, some obvious steps can be taken. Therefore, a set of rules needs to be established. For the same reason that we have society – attempting to fetter self-interest and somehow harness it to help the larger community – there need to be laws in the kitchen. An equal sharing of responsibilities is of course ideal, but it’s always a tricky balance to attain. If someone always eats out or rarely uses the kitchen, should they have the same responsibility as someone who spends most of the day there? And even if you can divide responsibilities, fairly scaling them would be impossible. Sadly, there’s no way to achieve perfect fairness, but that’s not the goal, either. A clean kitchen is the goal. Nobody wants to clean the sink, the fridge or the microwave. So, as in a society of law, there need to be enforceable responsibilities that are as close to equal as possible. There are two classic law-based systems to compel behavior: punishment and reward. They vary in effectiveness given the situation, but either system should carry enough severity to compel behavior. As we live in a democracy, both the policies and consequences should be established by the community. It’s fun to think of all of this philosophically (seriously, I’m a good 800 words deep into talking about office kitchen hygiene), but as we know, groups always have defectors. No matter what the rules are, they will be broken. A good leader has to deliver punishments and rewards, codified in some set of policies. These policies must ensure the leader has the authority and responsibility to dole out consequences for behavior. A good leader has to foster communication when people have different priorities. People have different ideas about cleanliness, and a leader has to reconcile these interpersonally, communicating the message that an office kitchen is supposed to be clean, but not too clean. A good leader also has to step up to the plate when others don’t, and that means picking up the slack. By example, leaders can establish a general code of conduct for the office, and while there will be kitchen defectors, there will be volunteer kitchen stewards as well. Even though kitchen management may not seem like a big deal, we all know it makes a big difference in workplace happiness and team chemistry. As such, relying on everybody to do their best on a volunteer basis won’t work. At the end of the day, it’s the result that counts, and that’s a leader’s ultimate responsibility. Now, thanks to the leadership and system – a mix of mutual responsibility and redeemable reward points – established by Diana, our office administrator, our kitchen is consistently clean. Thanks, Diana! Still, we have to try. 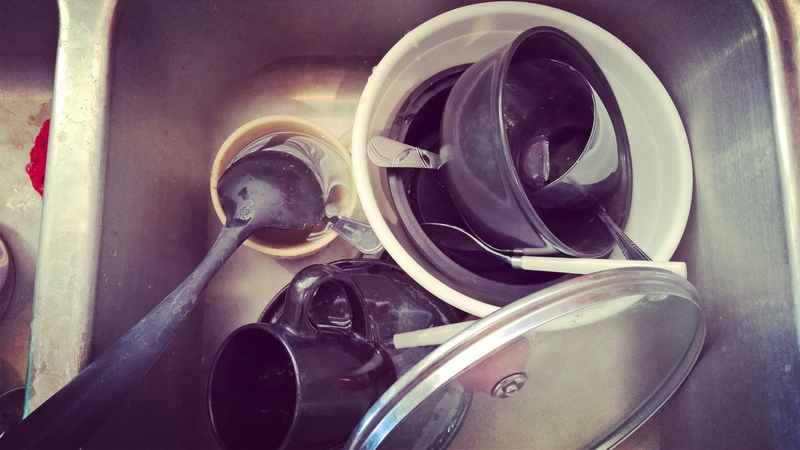 To improve our lives at work at in general, we must throw everything we have at the tragedy of the commons problem – everything, including the kitchen sink. I thoroughly enjoyed reading this! I was hooked from that first quote in the high school restroom, and I never thought I’d learn some sound leadership lessons from a blog that started around a conversation of shared/office cleanliness. Can’t wait for your next piece. This spoke to my soul! It really should be required reading for every office.